Prof. Stig Bengmark, MD, PhD. Dr. Bengmark’s astute and timely observations of the impending disastrous misdirection of modern medicine is more than alarming – it is numbing. And his answer to this avoidable catastrophe is surprisingly simple. Dr. Bengmark writes that the endemic chronic diseases such as diabetes and Alzheimer’s will overwhelm the health care system. “No health insurance system, governmental or private, will have a chance to survive under such conditions, ” he emphasizes. He notes that the cost of healthcare doubles every ten years and will constitute one half of a family’s income by the year 2020 if nothing is done. Dr. Bengmark writes that the “deadly quartet” of excessive weight, high blood pressure, uncontrolled blood sugar and arterial disease pose a greater threat to health than the added effects of smoking tobacco and alcohol abuse alone. He says the “mother of all disease” is often if not always the result of a “malfunctioning gut flora” that induces weakened immunity and low-grade inflammation. He says the early warnings signs are symptoms of unexplained fatigue, sleep disorders, headaches, hair loss, greying hair, skin rashes, dry eyes, brittle nails, dry mouth, constipation or diarrhea, chronic infections, mental depression, breathlessness, sweaty feet and hands, mental depression, all which should not be ignored. He faults human diets centered on animal products. 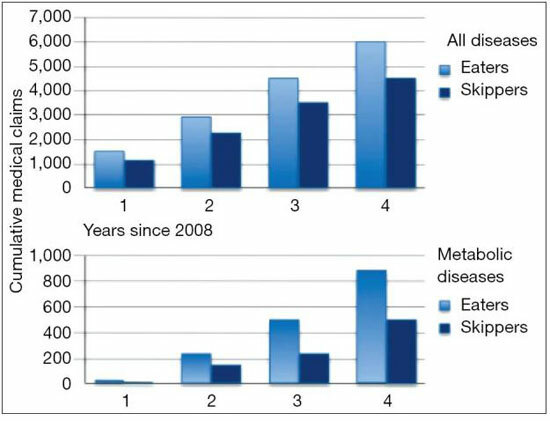 Dr. Bengmark says the large increase in dairy production and consumption was almost immediately followed by a “typhoon of obesity and chronic disease.” To confirm Dr. Bengmark’s theory, dairy-producing countries such as New Zealand, North America, Ireland and Scandinavia have the highest rates of heart disease in the world. While Dr. Bengmark writes about many aspects of the problem, which includes sleep disturbance and exposure to obesogenic chemicals, he proposes nocturnal (nighttime) fasting as a solution to the relentless increase in the diabesity epidemic. Dr. Bengmark proposes those adults who are in state of “unhealth” should consume their last meal of the day around 6 PM and not resume eating till 10 AM the next morning, providing 16 hours of “stomach rest.” He notes that late-night eaters and early breakfast eaters require more medical attention than breakfast skippers and early evening eaters. You can read the full text of Dr. Bengmark’s report here.